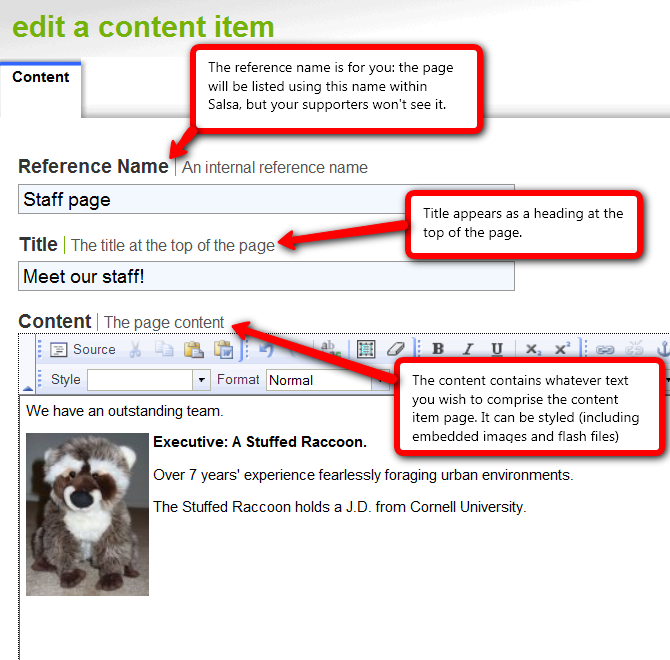 Custom content items enable you to create any type of user-facing content. (Think of it like web hosting.) T hough they can be coded to behave as such, custom content items are not forms which require the user to submit information or take an action. Donation pages -- may Salsa clients design their own donation pages to handle their unique giving needs. They generally start with the documentation on this page, as it gives a good overview of what's required to make a donation page work. Salsa does not provide support for custom content items, because each item has unique code provided by customers and clients that is not Salsa-generated. However, we will do what we can to give you advice about how to make them work. Configuring a Salsa content item is a simple three-step process, described and shown below. Throughout Salsa, Reference Name fields provide an internal reference for you to identify the page; it is not shown to the public. The public name of the event will appear as a banner headline atop the page (in h2 HTML style). This will also set the HTML "title" element of the web page, meaning that the name you place here will generally appear as the page's name in most browser tabs or panes. This field, the "meat" of the content item, appears after the Title, and can be HTML-styled using the WYSIWYG editor, including images, links, and video embeds. At any time, you can click the "Source" button of the WYSIWYG to access the page's HTML code. Create a version of your desired page in the appropriate Salsa tool (for instance, by building a Signup Page). View the end-user appearance of that page. Select "view source" in your browser to view the HTML source of the end-user page. Return to the content item. Locate an appropriate spot and paste in your copy of the HTML form from the other Salsa page. You'll need to have some comfort working with HTML (and perhaps CSS) to do this, and you'll need to troubleshoot your own results. Unfortunately, we are generally unable to provide HTML support on custom pages, including customized content items. It's a very good idea to study a Salsa-produced donation page to make sure that your custom donation pages have all of the fields required by the merchant gateway that your organization uses. recurring Whether or not the donation is recurring. Must be zero (0) for one-time donations. Must be one (1) for recurring donations. TERM Number of payments to collect. Use '9999' for unlimted payments. How often to collect the amount. amount Number of currency units (typically dollars) to donate. Can have a decimal followed by two digits. May not contain dollar signs or commas. Can I paste from Microsoft Word? No. Copying from Microsoft Word copies not only HTML but a lot of junk that is not HTML. That junk probably will mess up your page when it's used, so you should not paste from Microsoft Word. Will Salsa fix X in my custom content page? No. Salsa does not support custom content pages. We will answer questions about how they work, but the maintenance of a custom content page is your responsibility. Does a custom content page use a template? Yes. Templates are assigned in the Publishing area when you are editing a custom content page. If you do not explicitly assign a template to a custom content page, then Salsa will use the default template for your organization. Can a custom content page contain SalsaScript? Why doesn't my custom content page have fields filled in when it is displayed? Salsa makes a distinction between its own pages and custom content pages. Salsa provides automatically fills the fields of its pages, but that facililty is not available to custom content pages. The next best alternative is to use something like the jQuery Cookie Plugin to create and manage your own cookies for your custom content pages. Caution: You should never put credit card numbers, expiration dates or CVV2 digits ito a cookie. That would allow bad guys to steal from your donors. Besides, Salsa specifically prohibits saving credit card information anywhere, not even in Salsa's own databases, so not storing that stuff is a Best Practice.